SANTA CLARA, Calif. (AP) — The Los Angeles Rams have gone from one of the NFL’s biggest surprises to one of the top Super Bowl favorites in just one year. 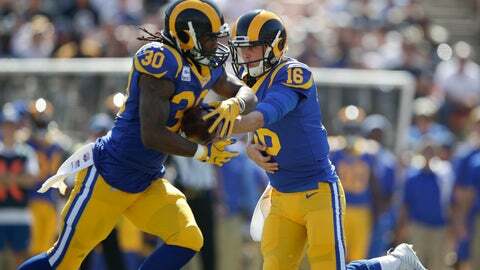 The Rams didn’t rest after an impressive turnaround campaign in coach Sean McVay’s first season, bringing in an impressive offseason haul led by three former All-Pros on defense in defensive tackle Ndamukong Suh and cornerbacks Marcus Peters and Aqib Talib, along with big-play receiver Brandin Cooks. It’s perhaps the most talent added in one offseason since the San Francisco 49ers brought in Deion Sanders, Ken Norton Jr., Rickey Jackson and Richard Dent 24 years ago and ended up as Super Bowl champs. The newcomers join a roster that features a promising young quarterback in Jared Goff, an elite running back in Todd Gurley, a stout offensive line led by left tackle Andrew Whitworth — and perhaps Defensive Player of the Year Aaron Donald, who held out for a second straight training camp but could be back for the start of the season. Seattle still has Russell Wilson but few other key pieces from the 2013 Super Bowl team, and Arizona has three of the division’s top players in receiver Larry Fitzgerald, cornerback Patrick Peterson and running back David Johnson, who is coming back from a wrist injury. Los Angeles brings back 10 of 11 starters on offense, with the only change at receiver where Cooks replaced Sammy Watkins. It’s a far cry from last year when the Rams broke in two new offensive linemen and a new receiver around Goff, who was getting ready for his first full season as an NFL starter in a brand new offense. This team clearly has big-play potential. Cooks is one of the league’s best deep threats and Gurley led the NFL in yards from scrimmage (2,093) and TDs (19) last season, earning him the rare big-money contract as a running back. JIMMY G: The 49ers fortunes changed almost immediately after acquiring Garoppolo at last year’s trade deadline. A team that started 2017 with nine straight losses finished with five straight wins after Garoppolo took over as starter. He completed 67.4 percent of his passes last season, averaging 8.8 yards per attempt with seven TDs, five interceptions and a 96.2 rating to improve to 7-0 in his career as a starter. His 308.4 yards passing per game in his five starts also would have led the league had he played a full season. LAST HURRAH: The Seahawks have been one of the most consistent teams in the league under coach Pete Carroll the past few years. Seattle has posted six straight seasons of top two finishes in the division and winning records, missing the playoff only last year. But much of the core of the team that went to back-to-back Super Bowls in the 2013 and ’14 seasons is gone. Defensive end Michael Bennett was traded, cornerback Richard Sherman was cut and wound up with the archrival 49ers, tight end Jimmy Graham left as a free agent and defensive stars Cliff Avril and Kam Chancellor have had career-ending injuries. Even safety Earl Thomas’ status is in doubt as he has held out all offseason in hopes of getting a new contract. PREDICTED ORDER OF FINISH: Rams, 49ers, Cardinals, Seahawks.